I don’t know about you, but when it comes to desserts Carrot Cake is appreciated no matter when, but naturally with the budding of new blooms and a new excitement for fresh food Carrot cake is more then welcomed! Recently my friend Natalie and I were trying to figure out how to spice up the traditional carrot cake recipe. Thankfully as we thought about it, my husband Daniel popped in with the ingenious idea of creating carrot cake pops! If it’s as hot or busy it is here in Florida (hello spring break!) you’ll be happy to hear that this is a no-bake recipe! 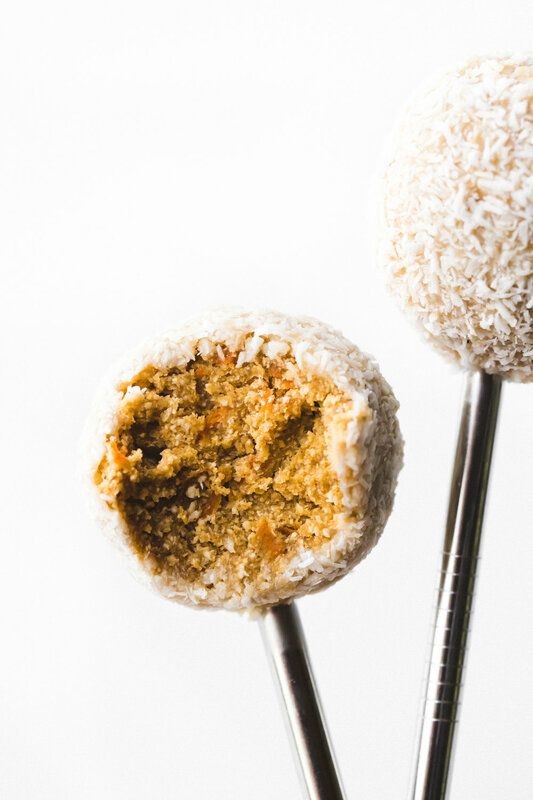 SO These perfectly delicious and healthy carrot cake pops are no-bake, Vegan, Gluten-free and FULL of flavor! Definitely a recipe to make the whole family happy! Combine all the wet ingredients and then add in the dry. Roll into cake balls and let chill in the freezer for about 15 minutes while you make the glaze. For the glaze mix together all the ingredients, making sure that your coconut oil is melted beforehand. Take the cake balls out of the freezer and coat with glaze and then coconut! I don’t know about you, but when it comes to Easter I love how cute the different colors and decorations are! It’s really the only time of year where decorating with pastel colors and bunnies is totally acceptable. Now I love all the fun colors put when it comes to making those colors happen in our food, dyes a really not my favorite thing. It’s one of those things to make food more fun and festive, but are extremely toxic! If there’s one thing we should kiss goodbye its artificial dyes, but does it mean we have to stop making food colorful and fun all together? Definitely not! There are plenty of natural foods used to create those beautiful colors! Here are some of my all-time favorites! This is one of the simple ways to replace toxic ingredients in your kitchen while keeping your kiddos excited and healthy food fun! Here is an example of Easter inspired parfaits! • Combine liquid and chia seeds, mix well and set aside to let gelatinize. • Separate the yogurt into equal amounts and add color. Start with small amounts and add more until the desired color is reached. Mix in honey to taste. • Add Chia seed pudding, then the yogurt mixture and top however you like! It would be a fun project to gather toppings fitting your theme and have your kids decorate them individually! I don’t know about you, but when It comes to Zucchini Bread I take things VERY seriously. Zucchini bread is one of those foods that is a win-win for both adult and child. Offering a sweet bread that kids and adults love while sneaking in some much appreciated green vegetables! Now even though it’s a winner, some of the more traditional recipes usually call for a good amount of gluten, dairy, sugar, etc. that usually put the zucchinis hard work down. I was trying to figure out a way to make zucchini bread healthier without taking away all the good things it had to go for it. Things like a perfectly moist (don’t you just love that word?) and its sweet caramel taste! Well, I have done it, folks, this Zucchini bread is Refines sugar-free, dairy free, gluten free, and can be made without oil if you substitute it for Applesauce! So here’s the recipe you and your taste buds have been missing out on! Put the Zucchini, Melted Coconut oil, Dates, Eggs, and Vanilla in a blender or food processor and blend until liquid. Mix together the dry ingredients and then combine with the Liquid Mixture. Put in a bread tin or square pan and top with your favorite nuts or seeds. You can also mix things up and sprinkle cinnamon and coconut sugar or cacao nibs on top! Bake in the oven at 350 F for 25 to 35 Minutes. Let cool for about an hour and then enjoy! - Sonya Expert Zucchini Bread Baker. I don’t know about you, but when it comes down to cookies going gluten-free doesn’t really hold the best options. Thankfully this recipe makes up for all of the moment’s when you questioned a baked good that wasn’t made of flour. This cookie cup tastes like a chocolate brownie filled with a creamy mint filling that perfectly mirrors the flavors of mint chocolate chip ice cream! So, without further ado here’s the recipe! Preheat the oven to 350 F. Coat the bottom of a full sized cupcake tin makes about 6-8 cups and bake for 20-25 min to make 6-8. For mini cups the recipe makes 20-24 cup, baking them for 12-15 minutes. Let cool and then fill with mint cream and top with chocolate chips! I don’t know about you but when it comes to the morning I love to start things off with a bang and if you have seen my Instagram stories, you know that means a smoothie bowl! I love that a smoothie bowl tastes like my favorite frozen dessert while still offering you a nutrient dense and fun way to start off your day! Now, I’m a morning person, so don’t limit yourself to just breakfast with these babes. I like to make the filling by adding fiber, healthy fats, protein and vegetables to make sure that I’m getting a meal that tastes like dessert, but also offers all the nutrients needed for a well-rounded meal! This smoothie is a go when I am in the mood for something a little less sweet because of the raspberries and non-dairy yogurt. I also add in two optional ingredients, the first being flax to add in fiber. This is so that you can digest the smoothie easier, but you can either skip or use chia seeds instead. The second ingredient is gelatinized Maca root powder, I take this to help balance hormones and it also adds a caramel flavor that’s really good! You can find both of these products by clicking here ! Okay, so now you know all the details, let’s get on to the ingredients list! • Pour into an aesthetic bowl and top appropriately…aka with all your favorite goodies! So there you have it folks, an easy, delicious and nutritious way to start your day off right! Let me know what you guys think in the comments below and show some love by hitting that like button! I don’t know about you guys, but when it comes to Valentine’s Day treats the options are endless. The problem is that these options are usually not so much dairy free and gluten free. Plus making something is more of a romantic gesture then a store bought box of chocolates (Not that I will ever say no to them). So in order to combat the issue at hand my friend and I came up with a gluten, dairy free, chocolate filed and EASY recipe to whip up for your special someone. So, now that you know how much you need this recipe in your life this Valentine’s Day, or any day, here it is! Mix the yogurt and sun butter together and spoon half of the mixture into jars. Add in cocoa powder and salt into the other half of the mixture and mix together. 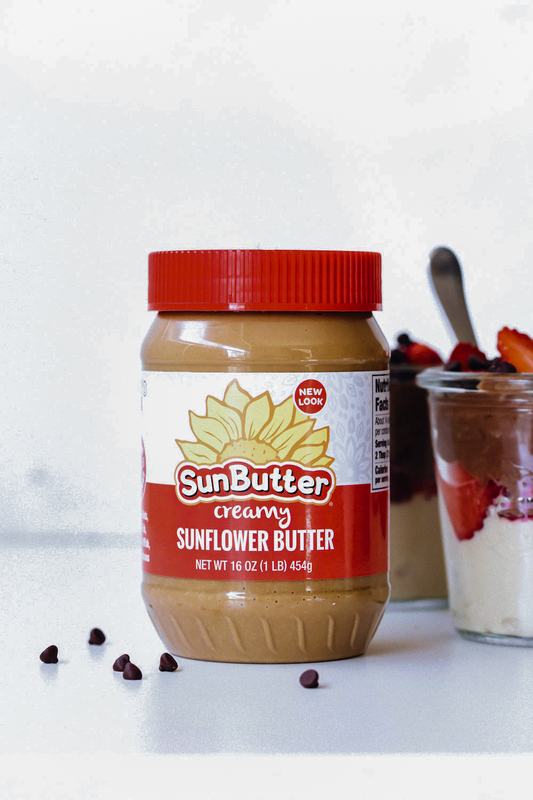 Spoon the rest into the jar and then top with strawberries and chocolate chips. Serve to your special someone, and enjoy! I’m not sure about you guys, but when it comes to the holidays the most important thing is of course family, but the second most important is always dessert! I always loved making fun new treats, but this became a bit harder to recreate when I went dairy and gluten free. I was determined to remake some boss desserts so that when my healthy treats came out, all else was forgotten. I have had some really good recipes so far but this one takes the cake. Get it…cake…or pie I guess. Anyways, this recipe was inspired by the classic peanut butter pie and I have to say, I ended up liking it better than the classic. SO without further adue here’s the recipe! · 1 & 1/2 cup pitted and soaked dates. For the crust soak the dates in hot water for about 15 minutes or let soak overnight in the fridge. Save the water for the individual layers. Pulse all ingredients for the crust together and then press into the pie plate. Let set in the freezer while you make the layers. 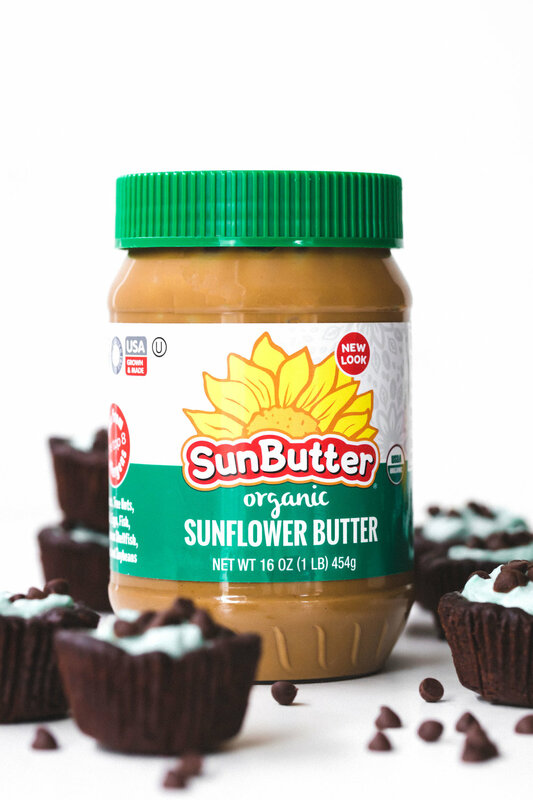 For the Sunflower Butter layer use a mixing bowl and fold ingredients together until combined. Pour into pie pan and let set in the freezer. For the chocolate layer blend all ingredients until fully combined. Add in more of the date water if needed to blend but make sure the moisture does not become watery, but keeps a thick and creamy consistency. Pour in the last layer and let sit in the freezer. Top with your favorite toppings such as nuts, coconut, chocolate, ice cream etc. 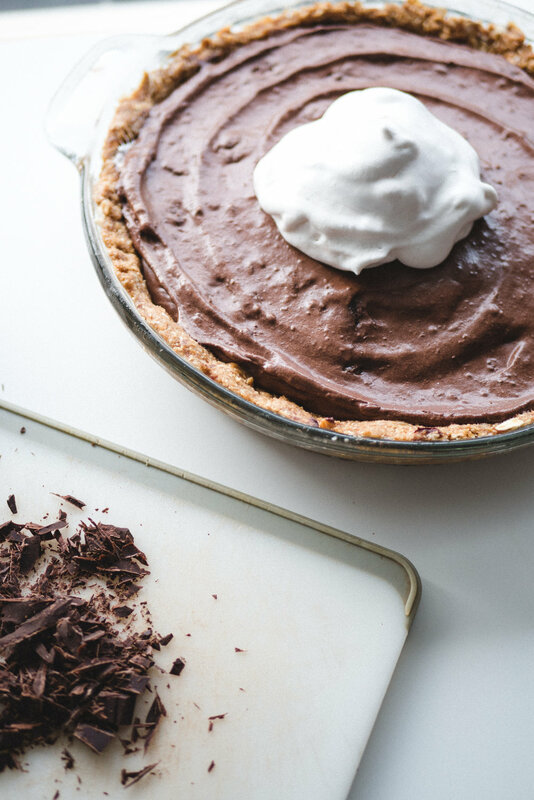 Here I used coconut whipped cream and shaved dark chocolate! Bring to your next party and watch your guests as they stare in awe of this beautiful creation! I don’t know about you guys, but sometimes when I get a little ah...hangry at night all I can think about is ordering dominos gluten free pizza without the cheese. I then realize how terrible that actually sounds and I begin to think a little straighter. The problem is that I usually still want to something resembling junk food because it’s quick calories that taste fantastic. Thankfully in my most recent moment of hangry junk food craving moments, I realized that chicken, gluten-free flour, and ketchup were about to become my best friends. 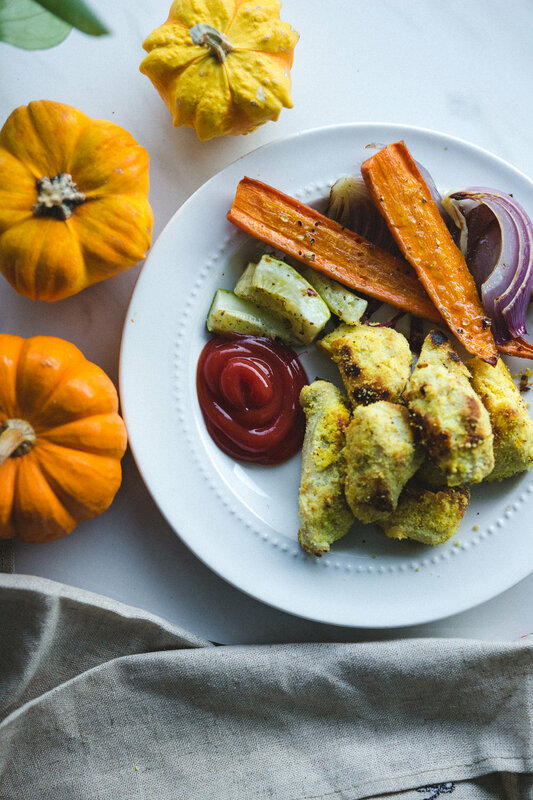 This is my recipe for healthy Chicken nuggets. I want to give a shout out to the hunger inside of me to help motivate this nugget of gold. · Cut your chicken into roughly 1-inch cubes. 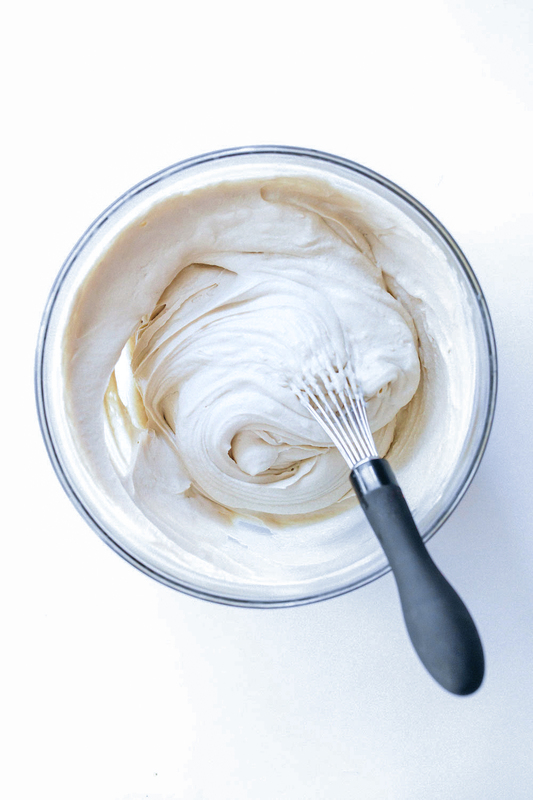 · Combine coconut flour and spices together. · Whisk the eggs together in a separate bowl. · Dip the chicken in the egg mixture then into the flour mixture. · Cook chicken over medium heat with coconut oil until cooked through and outside is crispy. · Once your chicken is cooked, grab some of your favorite sauces weather it me BBQ, Ketchup, salsa, etc. and enjoy! This recipe is awesome, but you might end up with a few crumbles in the pan. You can actually save these and use them for toppings for salads, kinda like informal croutons! Let me know what you think about the recipe, and what your favorite kinds of junk food that you would like to recreate! Now I am not the best at organizing, so I figured why not come up with a few “life hacks”. So far I think that I have really been able to outdo myself with minimal effort, take it of course that you might know a thing or two and I am just not coming to the realization, but in all honesty I am pretty pumped about these hacks so I will just take my little victory lap here and leave it at that. So without further, I will let you in on a few foodie secrets of mine to keep healthy habits and clean eating a breeze! • Hack #1: Freeze Smoothie components in an Ice Cube tray! Wait…do what? Okay, so this might sound strange, but hear me out! I love to have a smoothie every morning or at least once a day. They are easy to digest, I can get most of my supplements in and taste like candy…most of the time. SO the problem with smoothies is that I try to keep them low GI aka not a lot of fruit, but we all know frozen fruit is what makes them so creamy and delicious right...? What I like to do is add in things like avocado, pumpkin, coconut milk, coconut yogurt, and sweet potato so to make the ingredients last longer I take Ice Cube trays and freeze cubes of whatever items I have on hand that week. This way I can mix and match to make unique flavors and also keep my smoothies creamy and thick without sacrificing taste! I love every meal except for lunch, part of the reason is that it’s a reminder I have 4 hours left in the workday but mainly because it’s just a pain to think about making it. Not to say lunch is bad or that I don’t enjoy it, but it is so easy to run out of time to make a good lunch if you don’t have leftovers handy. This is why I but frozen vegetables! I swear it’s like a lightbulb went off in my head last week when I stocked up on about 8 different bags of frozen vegetables and began using them for lunches. What I typically do is either make a large batch of quinoa at the beginning of the week and vary between that and eggs for my protein. Then in the morning I choose a mixture of vegetables and throw them in a pan with some water, coconut amino, a handful of spinach and spices. I leave them to cook for about 5 minutes while I blend up my smoothie and voila I have perfectly cooked nutrient-dense lunch to look forward to that took basically no time at all! 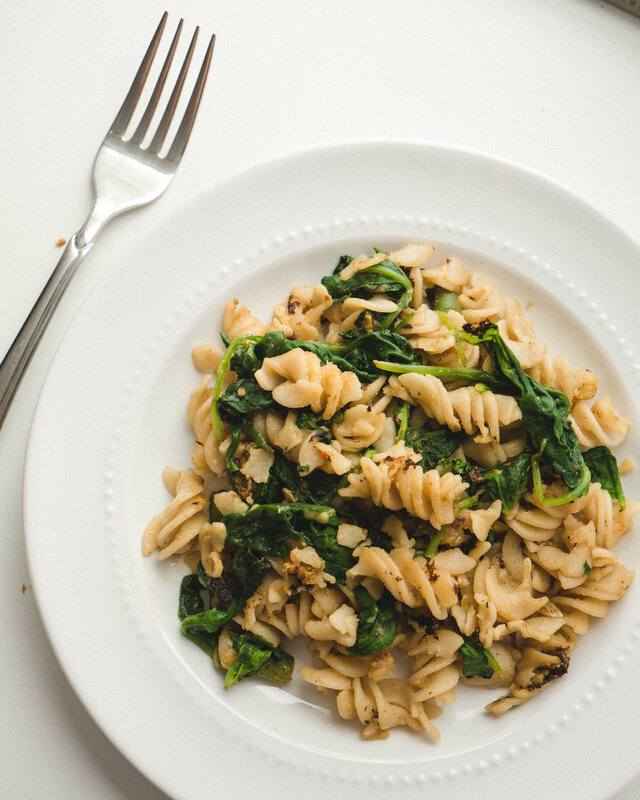 These are two of my favorite hacks lately that really have been making all the difference when it comes to preparing healthy and nutritious meals to get me through my day! What are some of your favorite healthy habit hacks to keep you fueled and feeling your best? Thank’s again for stopping by! I don’t know about you guys, but usually I am all about Thanksgiving and Christmas and let Halloween go by the wayside. And this year was going to be no different, until Natalie, Daniel and I had an idea to make a video. This of course was going to suite the theme of Halloween well and offer you guys a Gluten and Dairy free holiday treat, which is something I could’t say no to! Therefore even if you aren’t feeling the Halloween baking spirit…? Preheat that oven, watch the video and let the spooky Halloween vibes roll! SO now that you know you need these cookies in your life, here’s the recipe! In a bowl, whisk together the SunButter, coconut sugar, milk, and vanilla until smooth. Add the tapioca starch, cocoa powder, baking soda, and salt. Mix to form a thick dough. Scoop out 1 tablespoon of dough and roll into a ball. Arrange on a baking pan lined with parchment paper (leave room in between, they will spread so I only recommend 8-10 per pan). Repeat until all the dough is gone, you will need 2-3 pans/batches. Bake for 12-14 minutes at 350F. Let them cool for at least 5 minutes before moving to a cooling rack to cool completely. For the filling, stir together all the ingredients until smooth. Spoon a dollop of filling onto one cookie, top with another, and squish into a cookie sandwich. Add sprinkle eyes for extra Halloween vibes! Now that you are have all of the creepy baking vibes rolling, enjoy the recipe and let us know what you think of our creation! I don’t know about you guys, but when it comes to cookies I was always more interested in the dough over than the finished product. Lately I have been making quite a few pumpkin recipes and figured that it was suiting to create a gluten free dairy free and CHICKPEA free pumpkin cookie dough recipe. My good friend Natalie and I pulled together the idea over iced matcha lattes with you guys in mind! We created this recipe for those who have sensitive stomachs or want to eat more of a whole food based diet. This is why we decided to use ingredients like coconut flour and sunflower butter and avoided any products containing gluten or dairy! Now, thanks to my good friend Natalie and my husband Daniel here is a irresistibly good allergy friendly pumpkin cookie dough recipe! · Mix all of the dry ingredients together. · Add in the wet ingredients and mix until combined. · Fold in the pecans and chocolate chips or any other of your favorite mix-ins! · Scoop into a bowl and eat with a spoon or put it on top of a Pumpkin smoothie that you can find here ! Thank you again for stopping by and I hope you enjoy! I don’t know about you guys, but when it comes to pasta, tomato sauce is usually all I need. Last night I faced a predicament where my husband and I only had enough tomato sauce for one plate of pasta. We decided Daniel would partake in the tomato sauce and I had the exciting opportunity to create something brand new. I knew this could go horribly wrong, but I knew it was another golden opportunity to make something fantastic! Now before I give you the ingredient list don’t judge because it’s a little different and may I remind you this pasta child was born from basically desperation. So here is the final product, and I hope you give it a try! · Follow the directions to cook the pasta. 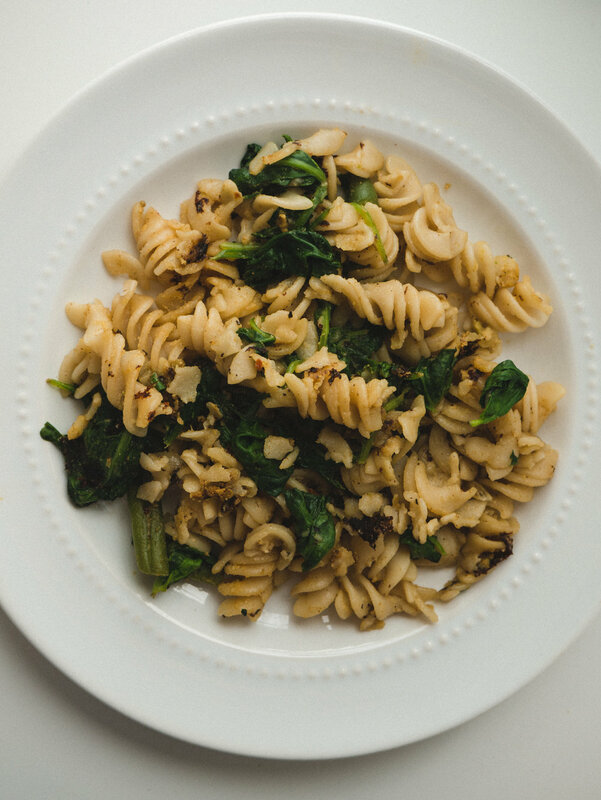 · While the pasta cooks take this time to cook up your spinach or any other green thing. · Mix everything together in a pan. Add in a bit of pasta water if anything starts to stick! · Now don’t wait any longer so plate that baby, eat up, and enjoy! Let me know what you think of the recipe and how you might tweak it a bit! I don’t know about you guys, but the pumpkin smoothie recipe from Monday just isn’t cutting it. My friend over at Feasting on Fruit and I have worked together to bring you this EPIC vegan pumpkin cake recipe that is sure to make you pumpkin spice dreams come true! the recipe you can find below as well as a fun video to show you the process! Not only is is simple, but so much fun. We HIGHLY recommend attempting the cake with a friend, because it’s just more fun that way. So grab your flannels, brew some coffee, and get the oven heated up because it’s time to bake some cake. · Mix water and Flax and set aside for 10 minutes to make the flax egg. 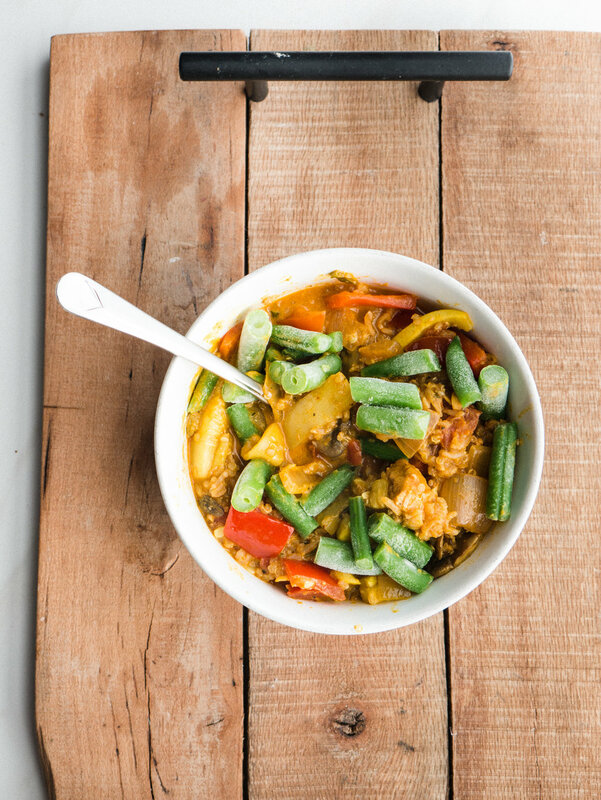 · In a large bowl mix together dry ingredients and set aside. · In a separate bowl mix together wet ingredients. · Add the dry and wet ingredients together and mix to combine. · Bake for 35 min at 350F. · While the cake bakes and cools blend together icing ingredients until smooth and creamy. Add in milk and/or coconut oil as needed. · Let the cake cool before adding frosting. Okay now I will go plan my next batch because unfortunately this one was gone in less than a minute by some very willing helpers! While I do that, grab a friend and give the recipe a go! Of course, don’t forget to let us know what you guys think of this Fall favorite! Love you all, and thanks for stopping by! I don’t know about you guys, but since I live in Florida the term seasons isn’t used very often. We have hot, really hot, don’t go outside, and cold or otherwise known as seventy degrees. This makes getting into the spirit of fall a little more difficult. You can imagine the dilemma of this New England gone South girl as I see my family and friend up north posting darling photos with their sweaters and fall foliage. Because of my dilemma, I have decided to crank up the AC, throw on a sweater and make a pumpkin spice treat that keeps you cool, while satisfying those cravings. Not to mention the benefits of pumpkin including potassium, fiber, and antioxidants! Another win for pumpkin is that it is easy to digest because of its high fiber, low starch, and low sugar content. I added pumpkin to my smoothies, while on the Candida cleanse as a substitute for bananas and it would help keep that creamy and rich texture that bananas provide! SO without further Aude, here is my fall smoothie recipe! · Place all the ingredients in a blender and you know the rest! I don’t know about you guys, but usually I am all about the decadent chocolate smoothies, but lately, I have found a new love. Let me introduce to you one of my new favorite smoothie bowls that’s creamy texture and flavor send you to heaven and back. My husband is not a fan of smoothies, but even his pickiness couldn’t stop him from enjoying this beauty! So without making you wait any longer, here is my raspberry smoothie that tastes better than candy. Blend it all up and enjoy! I topped mine with hazelnuts, chia seeds, and extra raspberries, but you can jazz it up however you like! I don’t know about you, but I like to do things my own way. I don’t like to depend on others or follow exact directions and therefore when it comes to blindly going into the grocery store to buy over priced items, I am not the biggest fan. This is not to say I do not buy groceries, but I like to enjoy the little victories off a non-conformist. 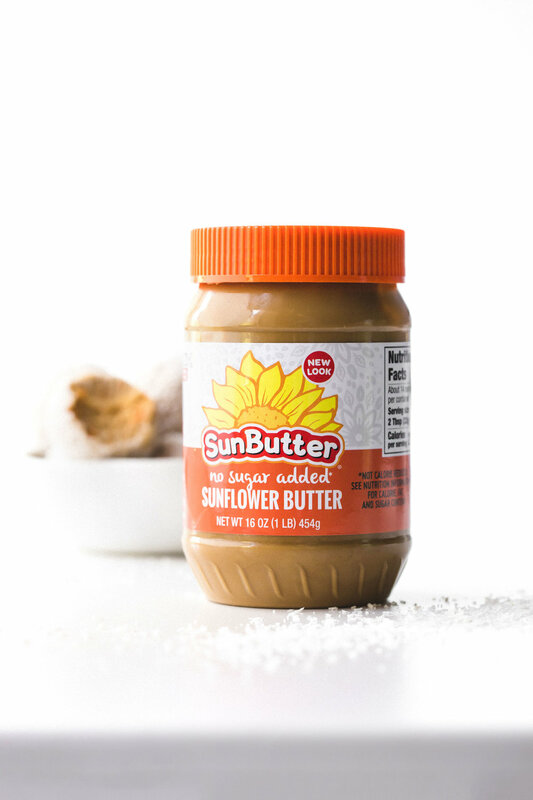 My most recent victory, was creating my own sunflower butter! I had grown tired of purchasing $10 jars of almond butter or going the cheap rout and getting peanut butter which I learned upsets my stomach. Due to my frustration I decided to try out sunflower seed butter. It ended up being cheap and didn’t upset my stomach, but unfortunately they all tasted like off. To add to my frustration the only ones that tasted good had sugar or was 45 minutes away at different grocery store. This brings me to my creating the first batch of sunflower butter ala Sonya! · Preheat your oven to 350 Fahrenheit. · Place the sunflower seeds on a large baking sheet. I use enough to cover the whole sheet, about 1 &1/2 cups to 2 cups. · Place in oven and toast for about 12 minutes. SIDE NOTE: You can skip roasting the sunflower seeds if you buy them pre roasted. Just make sure to check the ingredients. There can be added things like canola oil or salt. · Let cool for about an hour and then blend away! This should take about 5 minutes depending on the blender. 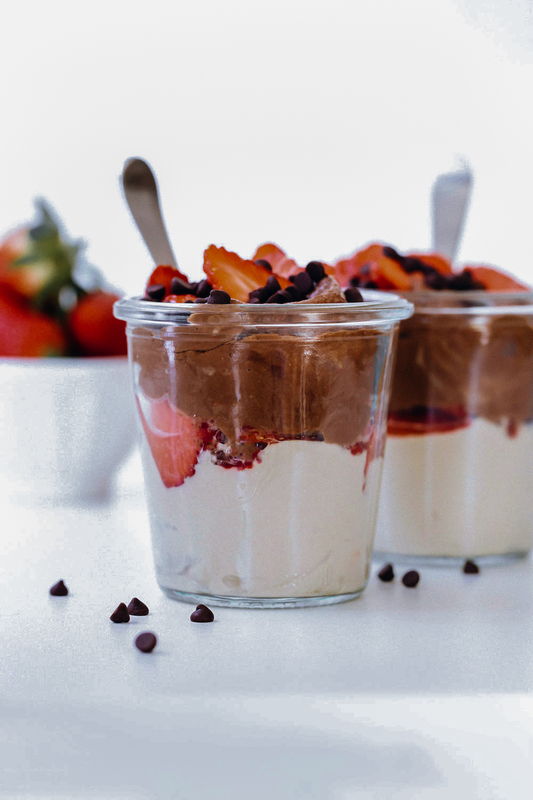 · Place in an airtight container, but don’t forget to take a sneaky taste! Overall, if I buy my sunflower seeds in bulk I can get about 2 jars of sunflower butter for only $5. Not only is it cheap and easy, it tastes delicious and you get the joy of knowing exactly what’s in your food! Let me know how you liked the recipe or if you have any questions! Thanks and hope you have a lovely time saving money and showing the non-conformist in you some love! Well this is probably one of the most perfect solutions to that problem. Not only are these a sweet treat, they are packed with healthy fats and protein that will satisfy your cravings, help you to feel full, and provide nutrients in your body. Soak dates in warm water for about 30 minutes until soft. Blend everything together until everything is combined. Hand roll into balls and then roll in cocoa powder, cacao nibs, coconut, etc. Let them set in the freezer for about half hour, store in the fridge and enjoy! I don’t know about you guys, but I get into these days when all I eat is “healthy” junk food. Aka popcorn, dairy-free chocolate, smoothie bowls, GF toast, peanut butter, etc. All fine on their own but when it’s all you eat in a day you feel a little crummy and in desperate need of some greens. This is when I resort to a huge salad with all the fixings, including homemade dressing of course! So here’s a little recipe for one of my latest creations! Now that you have your BOMB salad, top it with this heavenly dressing! Mix ingredients into a small mason jar and then massage into salad. That is a disappointment if you don’t start thinking out of the box! After the end of my lovely candida diet where sugar was a no go, I was able to incorporate some sweets again and decided that instead of going with anything store bought I would get resourceful! I had seen a recipe for a raw vegan cake and had been wanting to try one for a long while so I figured it was the perfect time to begin trying! The first year I attempted a double chocolate raw vegan cake, and it turned out smashing. Even my skeptical family members had little to poke fun at because heck, it was awesome. This year I decided to take a crack at it again, only this time with a coconut chocolate cherry Raw Vegan cake! Blend in food processor until roughly chopped. Spread mixture evenly across the bottom of a pie dish and place in freezer. 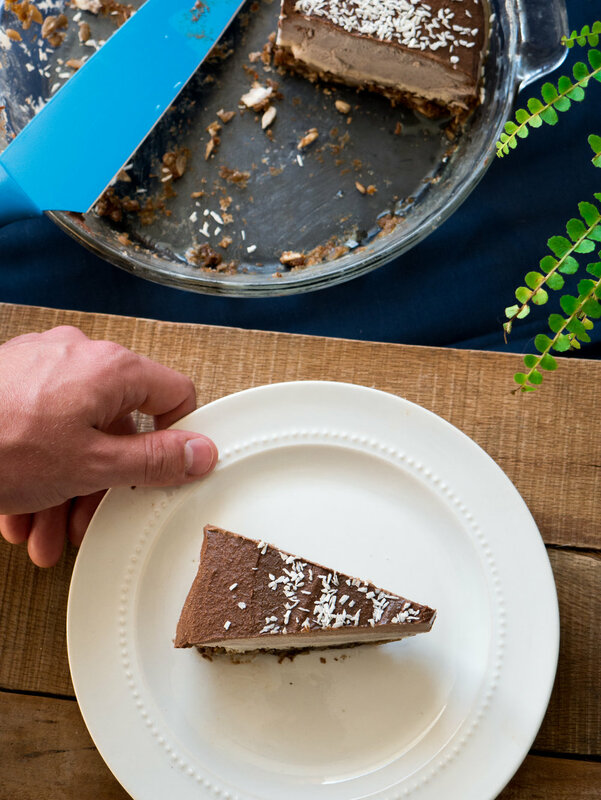 The first layer was simply Cashews, Coconut milk, and Dates for a creamy coconut layer. For this layer, you will need soaked cashews. You can soak them in cold water for about 5 hours or in hot water for 2 hours. Blend together and spread evenly in pie pan, then place in freezer. The second was the same coconut, cashew dates but to flavor it I added about 3/4th cup frozen cherries. This layer would have been awesome with a hint of lemon juice. The third layer was again coconut, cashew, and dates with about ½ cup cocoa powder and a pinch of salt. This will be your last layer so let it freeze then top with your favorites! I used coconut and since I am not a vegan I added some honey on top, but feel free to jazz this one up however you would like! Let me know if you have any Bomb Vegan cake recipes up your sleeve, or if you decide to give this one a try let me know! Not sure about you but I have a child like attitude towards life. I need to constantly use my imagination, if I don’t have a good routine I get cranky, exercise includes attempting cartwheels and catapulting into the pool, and I include chocolate milk in my diet whether it be in replace of coffee or a midnight snack. Since I technically am an adult I do try to take better care of myself when it comes to nourishment. SO in order to enjoy chocolate milk, I had to re-make the recipe to make it healthier! If you have a blender blend it all up and enjoy! In the summer I add a couple ice cubes and it’s like an extra cold cup of wonderful! If you don’t have a blender then mix all the ingredients with a splash of milk till you make a chocolate paste. Slowly add more milk and mixing till you have the perfect Chocolate Milk!